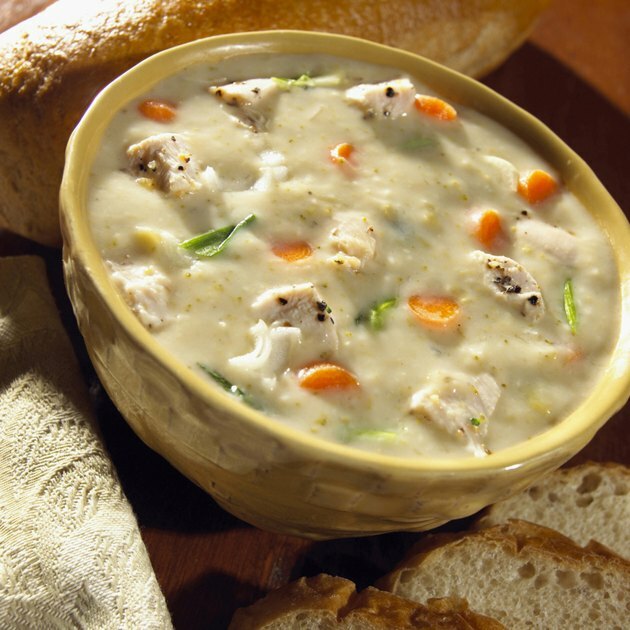 It's never too late to thicken chicken soup, and it usually works out better to thicken later than earlier because you can choose a thickener that fits best. For example, if you have a broth-based chicken soup with an acidic ingredient, you want arrowroot for its agreeability with food acids. If you need to thicken a veloute-based soup -- chicken stock thickened with roux -- you should keep it simple and add a beurre manie, or flour and butter. Elegant, luxurious chicken cream soups, on the other hand, often do best when thickened with a liaison, or an egg-and-cream mixture. Sprinkle 1 tablespoon of arrowroot or cornstarch in the mixing bowl for each tablespoon of broth. Use arrowroot if the chicken soup has any acidic ingredients, such as lemon juice or tomatoes. Use cornstarch if the soup isn't acidic. Whisk the starch and broth until a smooth and homogenous slurry forms. Chill the slurry in the refrigerator for about 5 minutes. Bring the soup to a simmer if it's not already heated, while the slurry chills. Whisk the slurry into the soup and cook for 2 or 3 minutes, whisking constantly. Serve the chicken soup as soon as possible. The soup will thin again after about 30 minutes if you keep it warm. Add equal parts softened butter and flour to a mixing bowl. Use about a tablespoon of each for every 2 cups of chicken soup you want to thicken. Work the flour and butter together into a single, homogenous ball. Divide the butter-and-flour mixture into tablespoon-sized portions and roll them into balls in your hands. Bring the chicken soup to a simmer. Drop a butter-and-flour ball, called a beurre manie, in the soup and whisk until it's fully incorporated. Continue adding the portioned beurre manie 1 tablespoon at a time until you've added one for each cup of soup. Simmer the chicken soup for about 5 minutes, or until it feels smooth on the back of the palate. Serve immediately. Adjust the heat on the stove so the soup stays cooler than 160 degrees Fahrenheit. Use a digital thermometer to check the temperature of the soup in the center. Whisk together one egg yolk and 3 tablespoons of cream for every 2 cups of soup you want to thicken. Ladle about a tablespoon of hot soup into the egg-and-cream mixture, referred to as a liaison. Whisk the hot soup into the liaison until it's fully incorporated. Continue ladling hot soup into the liaison and whisking until you've mixed equal parts soup and liaison together. Slowly pour the liaison mixture into the soup, whisking vigorously as you do. Judge the thickness and consistency of the soup as you pour. You might not need to add the entire amount. Taste the soup and check the mouth feel. It should taste creamy and smooth, with no "egginess." If it tastes "eggy," adding a touch of cream will take care of it. Serve the soup as soon as possible. Make roux, or equal parts cooked fat and flour, in advance and store it in the freezer so you can have it ready to go in case you have a thin soup in the future. Just add a tablespoon of the prepared roux per cup of simmering soup, and cook until the starchy taste cooks out, about 5 to 10 minutes.